Happy Tuesday! I am doing everything these last few weeks to stay strong. Returning to the real world after a life changing event can either lead you to move forward stronger than you were before or feel like a complete setback. While I have felt both in the early weeks of my return to work, I realize only more now than ever that I am someone who wants to grow and triumph out of the depths in which I unexpectedly found myself almost 7 months ago. If it makes any sense, I find strength in feeling strong. Many years ago, I lost two of my friend’s in a car accident and I remember attending the funeral. She was my roommate in college and my best friend. He was her friend. I surprisingly did not cry at the funeral, but became the person who helped everyone else cry and mourn. It wasn’t until much later that I felt the sting of the loss and what that meant to my 22 year old self while trying to find my way in the world. They told me “You are such a rock. You are so strong.” I hear that these days too. Yet through it all, I just keep thinking that I have to still allow myself to crumble now and again to feel rock steady. 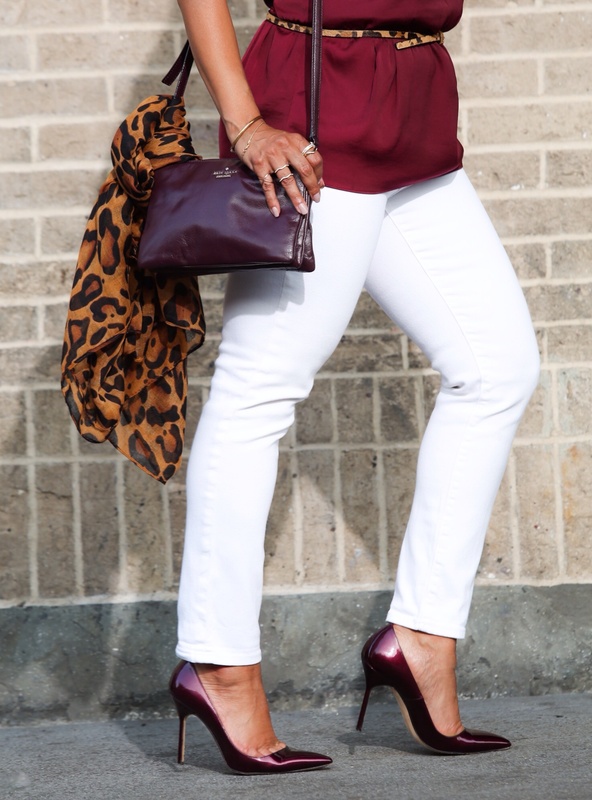 I enjoyed styling this look because I love a good wine colored anything (lipstick too!) and because it’s always fun to play with leopard print. During the hot summer days, I often find that I like to have a scarf on hand when I go out to eat or shopping indoors because the air conditioning makes you feel you’ve entered a deep freeze. However, you will not find me complaining on a hot and humid 90 degree day. Hence, the scarf! Pairing the burgundy wine tank with white jeans kept the look simply and classic. For a pop of print, I added a leopard print belt and tied a leopard print scarf to my bag to have it on hand. A scarf is always the perfect accessory to help pull an outfit together, especially when you are looking to keep your styling to a minimal color. The rule of 3 (3 colors within one outfit) with styling is great to follow because it’s the extra piece or color that can really bring a look together. I kept the jewelry minimal to keep the look simple as a result. Hope you enjoy! Thank you for reading! Next Post Hangout :: Strappy Sandals, Olive Vest & Links à la Mode! Stay strong girl and when you need a moment to let go, let go. Sometimes I need a good cry, a day to just be alone, or just a coffee break and I always feel better after than time to myself. Love love love this outfit – you look fantastic! This outfit is gorgeous!!! I love that color, and the shoes!!! perfect for summer.